A current project slated for completion this fall offers food for thought for the future of Paul Rudolph's Orange County Government Center. This was followed by news that the Democratic Alliance of Orange County is holding a press conference at the Orange County Government Center (OCGC) in Goshen, NY, on Tuesday, April 24, at 2:00pm. Batchelor and fellow designLAB principal Robert J. Miklos, FAIA, will present their UMass Dartmouth Library project and what lessons (and hope?) it holds for the OCGC. We have learned of your current dilemma regarding the Orange County Government Center and are writing to offer our experience and perspective based on a very similar project we are currently completing. 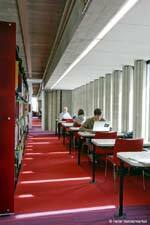 The Claire T. Carney Library UMass Dartmouth designed by Paul Rudolph is of the same era, construction type, and size of your building. The insights we have learned through the process of evaluating and working on it may be valuable to you as you weigh the options before you. 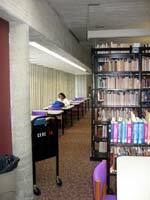 The goal of the project at UMass Dartmouth is to completely re-plan the outdated library to accommodate a state-of-the-art facility integrated with current technology. The design and planning process began in 2009 with construction starting in May of 2011. The first phase of construction was completed in February 2012, and the final phase will conclude this fall. The campus was built between 1968 and 1972 of cast-in-place concrete and concrete block. The library building, which is the focus of our current project, is made up of 155,000 square feet of renovated space over five floors and 22,000 square feet of added space. The total construction cost for the project is $31.5 million. It includes a complete mechanical upgrade that relocated primary ventilation equipment from within a series of internal building closets to centrally located rooftop equipment; as well as a complete lighting and electrical overhaul, the addition of an automatic sprinkler system, complete roof replacement, envelope analysis and repair, elevator overhaul, glazing replacement, and full ADA accessibility upgrade. The entire process has been completed under the requirements of the Massachusetts public construction process. As you can see, the building style and scope required is nearly identical to what you are facing, and the lessons learned from this process may prove valuable to you as you seek options for the future in Goshen. Early in the process we evaluated the costs of renovation vs. replacement, as well as effective strategies for how to integrate modern systems into a building with many inflexible infrastructural frameworks. Our research concluded that despite these constraints, the building was remarkably adaptable to contemporary requirements. We conducted comprehensive research into buildings of this type to better understand how to return many of the original colors and fixtures that had long ago been replaced with less-flattering substitutes. We also made many strong editorial changes, including removing and relocating a major stairway that created serious circulation problems, demolishing entire sections of wall to increase daylighting into the building, and enclosing several of the old roof levels within our addition to simplify flashing details and minimize future maintenance issues. The formerly underperforming building will ultimately be transformed into an environmentally responsible LEED-certified structure. We would like to offer you our experience and research. We have attached some images and renderings of the project from throughout the process for your reference. We are also happy to provide a side-by-side analysis of your renovation estimates compared with our actual construction costs. These costs may offer more value than many of the current estimates because they represent real dollars spent on an astonishingly similar project, rather than the assumptions required of estimates done at the early stages of a process. We would also be happy to offer any member of your community a tour of the UMass Dartmouth project that includes both finished spaces from Phase I, as well as Phase II work currently in underway. We are sure that this information will provide invaluable insights rarely available in the design and construction process, and we hope that you are able to take advantage of this unique opportunity.